October first marks the start of black history month, a yearly occurrence that celebrates and remembers the legacy of black history, past and present. 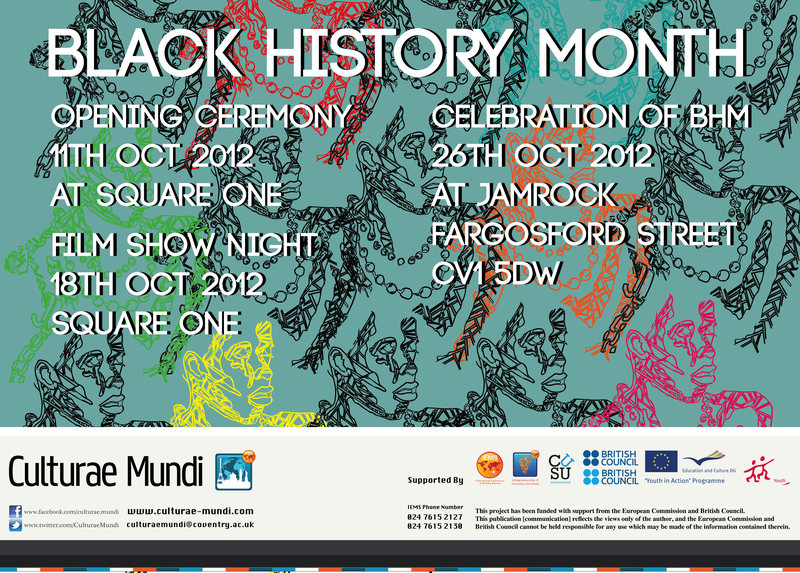 Along with the African Caribbean Society, the Culturae Mundi is hosting three very different events to mark the month. Kicking the month off on October 11th is a lecture with a twist. For £3 in Square One you can enjoy a night that includes a steel band, a choir, poetry and two lectures on black achievements and black civilisation that will be followed by a DJ and some snacks. Following this on October 18th a movie night will be held in Square One. The movie is yet to be confirmed but you can find out more information via regular updates on the Culturae Mundi website and twitter or facebook page. The month is then rounded off on October 26th with a relaxed evening of music, ethnic food and dancing. This will be a ticketed event of £3 and will be held at Jam Rock on Far Gosford Street. Each event offers a different kind of celebration and outlook on the month and there is definitely something to suit everyone. For unmissable experiences marking some of the most important hallmarks of civil rights history, make sure to check us out on Facebook and twitter to join us in celebration and commemoration.